Simply the safest, most fun way to experience the thrill of flying! 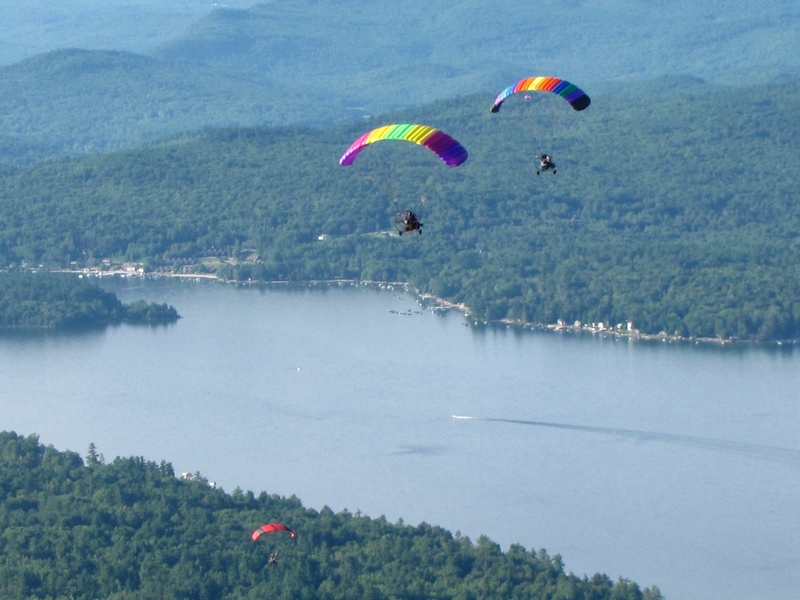 Coasting along on a chair in the open sky, a brightly colored parachute filled with air above you and beneath you is the diverse and ever-changing terrain of fields, roads, streams, and mountains of New Hampshire. On discovery flights, after a thorough pre-flight check, you sit behind the pilot and buckle into a harness. Once the take-off area is cleared, the instructor will call out “Clear Prop!” before adding throttle to the engine which will start the aircraft on a forward roll. With increasing speed, the parachute inflates overhead, and gently lifts the aircraft into the sky. Equipment including radio helmets, FAA certified flight instructor, clothing appropriate for weather conditions. Year-round, weather permitting. Mon–Sat 9:00am-5:00pm. (Note: the best flying is in the early morning or late afternoon during warm weather months). This experience is for one participant at a time. The best flying is in the early morning or late afternoon during warm weather months, and on a clear evening it’s possible to see the Boston skyline, more than 60 miles away. Wimpory said you where a great instructor. Please let me know what I have to do. Your message was forwarded to Carroll’s email chutesup@gmail.com. If you want, you can also call him at 603 491-2811. I am interested in a flight. Where are you located? Good afternoon Charles, it is lots of fun! You can call Carroll Werren at 603.491.2811 or email chutesup@gmail.com for where takeoff when and where times may take place. Beautiful Flight off to the Sandwich Fair! best fishfinder reviews on Price slashed for a Six Chuter Legend 210 SLSA!